If there’s anyone out there who still does not know what shade of blue my blood is, you obviously haven’t read many of my articles. Although I try my best (at times) to be as neutral as I can when creating videos or writing articles or simply posting content to either Facebook or the website (www.RivalryRage.com), I fail miserably most every time. Of course when your blood is Tar Heel blue, you simply can’t help it…in fact, I’ll go right ahead and say it’s pretty much impossible, at least for me. I was born in the early 80’s, the summer before Michael Jordan drained the game winning shot against Georgetown to win Dean Smith’s first NCAA national championship. I think I was about 10 months old, and even though I don’t remember this epic event, I know I was in the living room watching it with my dad. About 6 ½ years later I started playing the wonderful game of basketball, trying my best to “be like Mike” and other UNC greats. One Carolina player in particular that I tried to imitate more than once while playing was J.R. Reid, a big time recruit from Kempsville High School in Virginia Beach, Virginia. He was the best player UNC had seen since MJ had left just a few years earlier. 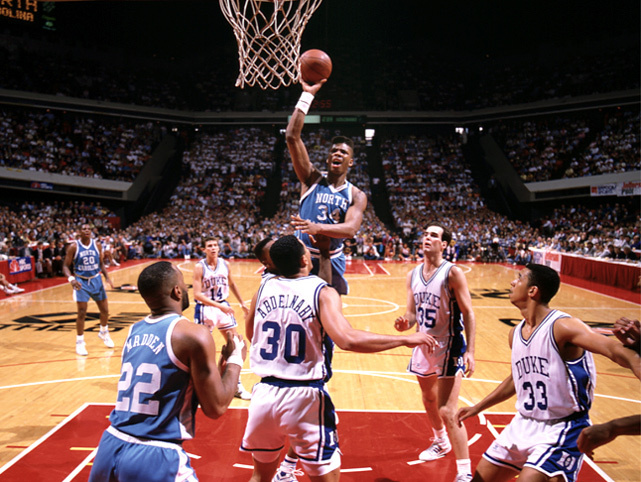 Mr. Reid, what was it like to play for Dean Smith at North Carolina? Of course I figured that his response would be something like that, but I had always dreamed of playing for Dean Smith, so I had to ask someone who had actually played for the god-like coach. Can you tell us about your first experience playing the Duke Blue Devils? How much of an impact did the “J.R. Cant Reid” sign have on you and how big a part did that play in UNC winning the 1989 ACC Championship that same year? Side note, Reid’s SAT score was higher than the two star players on the duke squad at the time. You may remember them…Christian Laettner and Danny Ferry. Tell us about that 1989 ACC Championship game. Some people still refer to that game as a full on war. “Yes, the '89 game was one of the most physical in ACC history, the two teams genuinely didn't like each other. The interchange between Coach Smith and Coach K during the game just seemed to really get us more determined to "stick it to them." Your former teammate Dennis Rodman was just inducted into the hall of fame. He would no doubt be in the hall of fame of trash talkers if there were such a thing. What was the craziest thing you ever heard him tell another player…of can you even repeat it? Dennis Rodman was a joy to watch, some people didn’t like him, all of which were for stupid reasons, but Rodman had heart and played with passion that cannot be found in every professional athlete. I can only imagine what it was like to play with such a competitor. So next to the last question…what life lessons have you learned from the game of basketball both collegiately and professionally? Please tell us all about your basketball camp and how basketball fans can register for your camp? And that my friends is what a true member of the Carolina family looks like. A man who has worked hard to get where he is today, and giving back to the community as a way to help others fulfill their dreams just as he did. A very special thank you to J.R. Reid for taking the time to talk with me and answer my questions. It was a privilege and honor for Rivalry Rage’s first ever interview to be with J.R. Reid. We hope that everyone will please check out his website (www.hrbc-jrreid.com) and see how your child or someone you may know can be a part of his wonderful camp.